The 38th Edition Blue Book of Gun Values is here! Order yours today. 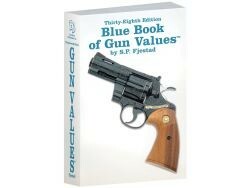 The 38th Edition Blue Book of Gun Values is here!, Order yours today. The firearms industry standard is back with an all new 38th Edition Blue Book of Gun Values! This edition has been updated with current market trends, values, and most of the new 2017 makes and models. With 2,512 pages covering 1,500+ manufacturers, nearly 30,000 gun model descriptions, and over 180,000 prices, this new 37th Edition contains more information, values, and history than any other guide on the market, by far! It also includes a more detailed Price Percentage Grading System (PPGS), and an expanded serialization section, allowing more dates of manufacture to be determined.